Combining the therapeutic benefits of controlled compression and cold, the Shoulder Cryo/Cuff helps reduce, swelling, and pain. The anatomically designed cuff provides complete shoulder coverage for treatment. 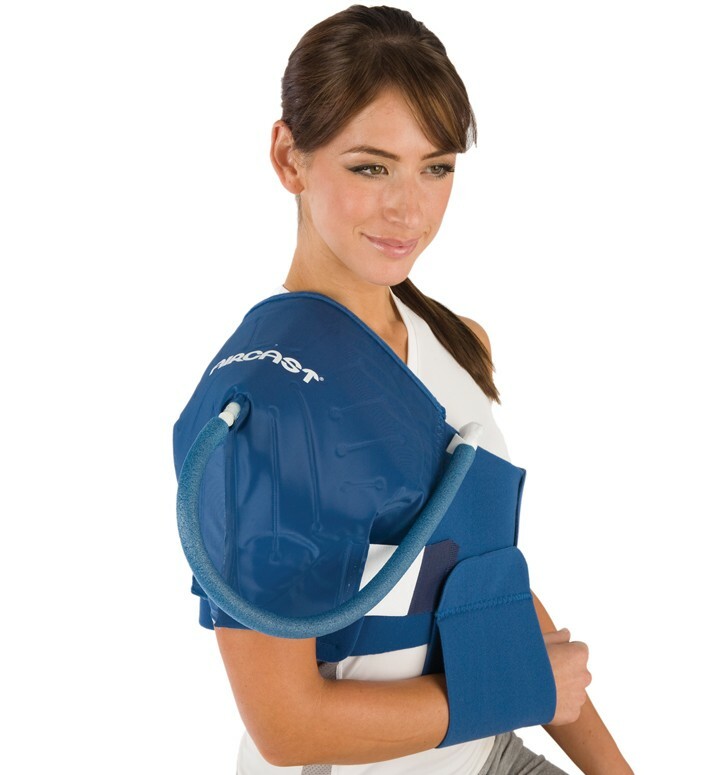 The Shoulder Cryo/Cuff can be ordered with an extra long strap (12AXL) to adapt to larger chest circumferences. All Cryo/Cuffs can be ordered as a single cuff, or with a cooler (including a tube assembly and insulation disk). The Cooler is available separately and can be used with any model in the Cryo/Cuff line. NON-MOTORIZED. can a motor be added to a non-motorized unit? Thank you for your question. The lid that contains the motor can be purchased in the Replacement Parts section of betterbraces.com.au. You would select AirCast Parts and find the lid labeled "AirCast Cryo Cuff IC Lid" https://www.betterbraces.com.au/aircast-parts-accessories. Should a shoulder cuff be used after shoulder replacement surgery. I already have the knee cuff & cooler. Does Medicare cover the cost of a new cuff? For a shoulder surgery you would need to get the shoulder cuff. I do not know if MC will cover that. Can I use my medical flex spending card to purchase the Aircast Shoulder Cyro/cuff with cooler? You would need to ask your flex medical plan if that is a acceptable item to use if for. Can you purchase the shoulder cuff with the motorized cooler? If so. How much? You will need a Physician's Prescription to purchase a Motorized unit. See the link below for costs. That replacement shoulder cuff is $84.99 and free standard shipping. Can the unit be use on either the right or left shoulder? Yes the cuff can be worn on either shoulder. How do you drain the cuff to put fresh cold water in? To drain the cuff keep the cuff attached to the cooler and lower the cooler below the cuff and loosen or remove the lid of the cooler. Should you have any other questions please call 800-553-6019. Once the cryotherapy session is over and the motor is turned off do I need to de-fill the cuff during periods of un use? Yes, as much of the water as possible should be removed from the cuff. I was just wondering if the coolers were reusable. I noticed the website says the coolers work with all cryo/cuff models so can you use the same cooler for different cuffs on different patients? Yes these coolers are good to use for years as long as you clean out and store them probably when they are not in use. Will I be able to 1) apply the cuff myself; 2) infate/activate the cuff myself? I have had cryo treatments in a Physio Therapy setting and have found it very helpful. Unless I can use and operate the cryo cuff system on my own, there would be no point in my purchasing. With the cryo cuff it is very easy to put on the cuff as well and use the system. I would suggest looking into getting the motorized unit, after your lift the cooler up and do a pre-fill, you will plug in the motor and it will continuously circulate the water for you until you turn the motor off. I recently purchased this item. This has been the best option to maintain cold therapy all over and around the shoulder area. Though it is fairly expensive (as I had to buy an extended size) this option worked very well for me as I have had the thermos/pump portion from a prior surgery. As I have had continuing problems with my shoulder, I plan on getting a lot of use from this item. It is well made, allows for disconnection while cold adding to the mobility. Great for single people as it can be applied without assistance. Trying to secure cold pads or frozen peas is very frustrating.